Picture the scene, with the last throws of summer leaving us, well at least here in the Uk, venturing out to the beach with friends, enjoying the scenery and chilled out feel of all. Someone decides it’s a good idea to put some music on and trying to listen to whatever comes out of the iPhone or iPad speaker. Right there is when the Nakamichi NBS10 Bluetooth Speakers come into their own. Once you realise just how handy and easy a set of speakers like these are to have about you find reasons to take them with you and keep them charged, well at least that’s what happened to me in the time I had them for review, but that’s not to say they aren’t without some problems. You get a pair of speakers here that can either work via Bluetooth Audio or via an auxiliary input, both speakers have their own aux import so you aren’t left with one useless speaker if you go down the cable route. Nakamichi NBS10’s can either be connected to individually via Bluetooth, giving you in effect 2 mono speakers, or you can pair them together for stereo sound and that advertised “3D sound effect” which the manual mentions. Whilst the speaker specifications may not be of a mind blowing nature these really are the sum of their parts rather than just focussing on one particular aspect. You’d think there would be more in depth specifications at either the Nakamichi website either USA, JP or .Co.Uk but alas not. There’s not even an updated instruction manual which makes using these speakers harder work than it needs to be. 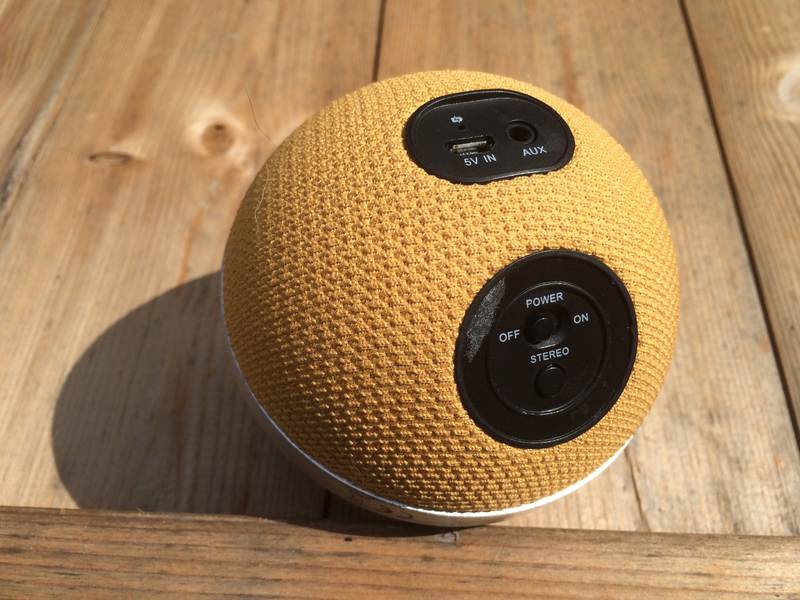 Surrounding the outsider of the speaker is a cloth material which is amazingly hard durable considering the knocks, bangs and trips to the beach all done in the name of testing. The only one slight downside is the silver band around the outside of my review units looked tarnished and like the silver had rubbed off a touch. That must of taken some scuffing for that to happen however and didn’t worsen during my testing. They were quite snug in the packaging when they arrived so i’ll give benefit of the doubt that the last reviewer perhaps didn’t pack them away properly. The silver bar houses the controls for volume up, down and bluetooth pairing whilst around the back (or the front depending on how you look at it) is a mini USB port for charging along with the auxiliary cable input. For those who aren’t in to the subtleness of yellow, pink, purple and black are your other choices and we’ve linked to them via amazon below. I’ve tried to make my testing as close to the real world usage as possible so to start with I fired up NetFlix on my iPad. Watching NetFlix using the speakers was a little bit like watching one of those old Chinese kung fu movies where they have been overdubbed and so the person speaking was completely out of sync with the sound. In one very small paragraph the manual does seem to indicate that the speakers will use a different channel if you re-pair the two units together. I’m guessing that’s what must have happened as the problem seemed to resolve itself after a while. Once you manage to decipher the gibberish that is the so-called manual and have both of the speakers paired together and with your device it’s not hard to immediately appreciate having louder speakers. Inside of each unit a 2-inch driver does the sound work producing sound thats punchy, clear with being slightly more toned to deeper more bassier sound yet avoid muddying the sound. when placed in the traditional setting of being to the left and the right of your monitor these aren’t a bad set of speakers but when you start tinkering with the position, say for example moving to the extremes of your desk and then turning them to face you that’s where the sound quality and the “3-D effect” really kicks in. In my very unscientific testing I found I got the maximum effect of the “3-D effect” when placed a couple of feet away from the left and right of me and turned slightly towards me. The sound “sounded” like it was coming from around me but not directly at me. Describing an aural experience like that isn’t the easiest of things to do but if you’ve ever used a Windows PC with same card software that lets you adjust sound to mimic a large hall or something like a stereoscopic effect then you’ll have an idea of what I’m babbling about. Outside on the beach the effect is obviously lessened but in those sort of environments you will be wanting speakers for their loudness than any fancy effects. Two watts of audio output is surprisingly good so much so that if you are having a conversation with someone in a relatively close proximity you will have to turn the speakers down to hear what the other person is saying. Switching from Bluetooth to the auxiliary cable didn’t really seem to make that much of a difference like it did with the Edifier Luna Speakers we reviewed not so long ago which in itself is surprising. Bluetooth range is 10 m and that is measured from the placement of your device to the speakers. In my anecdotal testing this seemed to be spot-on and even managed to get through some of the thick walls in my house. It would be nice if both of the speakers were named differently when pairing them to your device as each speech you can function as an independent device in its own right sometimes it’s just potluck that you select the correct speaker from the list. Being spherical they can be a touch tricky to place. When you take into account the quality of the audio, getting effectively two speakers for the price of one and the all-important price point these really are a cracking set of speakers. It’s just a shame that there is some design niggles and that horrifcally written manual taking the sheen of the products overall score. Next Next post: Looking To Trade In Your iPhone for an iPhone 6? Amazon’s The Best Bet But..